This exciting new title joins our incredibly popular Introduction to Fossils and Introduction to Rocks. All use the same graphic design, resulting in a matched set. Together they provide a comprehensive overview of the building blocks of earth science. The poster begins by defining a mineral and then explores the relationship of minerals to atoms and molecules. The all-important crystal structure is introduced, followed by informative text and illustrations that introduce all six crystal structure classes. This is followed by an outstanding presentation of the actual mineral classes - natural elements, suflides, sulfates, carbonates, etc. Collectors and students naturally want to identify their specimens. However, specimens of the same mineral can vary greatly, which can make that a difficult task. Identification has traditionally been based on the observation of physical properties: hardness, habit, luster, cleavage, specific gravity, color, fluorescence, streak, etc. The bulk of Introduction to Minerals presents those properties through informative captions, illustrations and carefully selected photographs. The emphasis is on how to use the physical properties for identification. There are approximately 100 common minerals. Over 60 of them are shown on this poster, making it even more helpful for identification. For even greater help, use Introduction to Minerals with our popular Minerals (see link at left), as it presents a whopping 162 magnificent mineral specimens, all grouped by class. 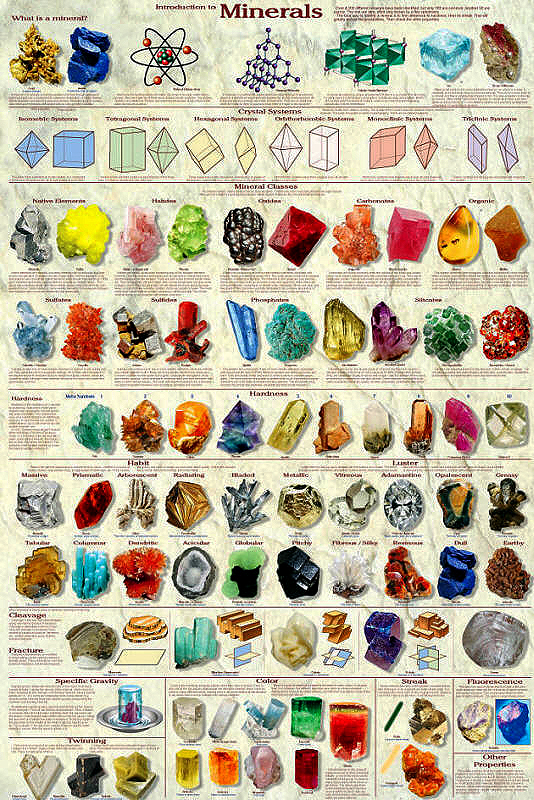 They include almost all of the common minerals and most of the 50 minerals classified as scarce. The others are considered rare to extremely rate.